This may not seem like much, but I actually have a pretty decent fear of heights. 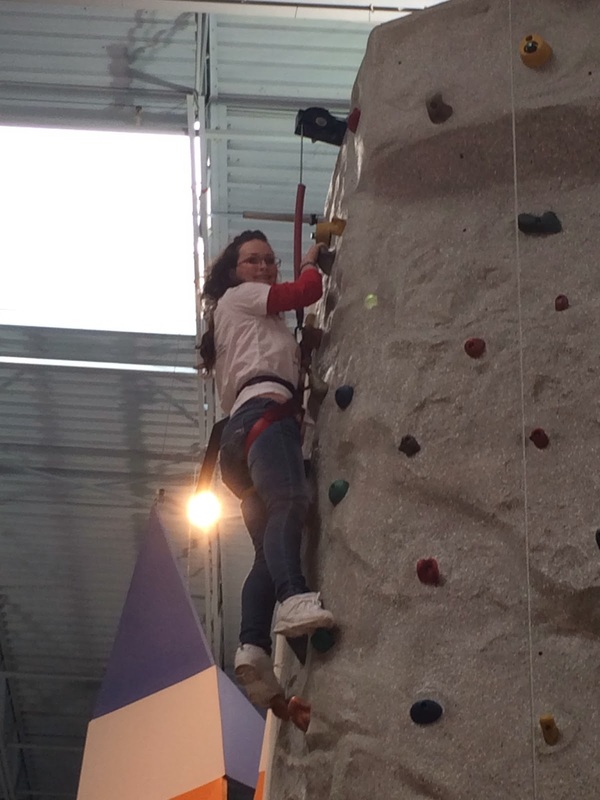 It'd been my goal for awhile to climb a rock climbing wall, but I hadn't done it because I didn't want to get shown up by a bunch of 3rd graders making it to the top, while I was stuck a few feet from the ground crying for my mommy. The lines are always pretty long for them at the fairs and carnivals I usually see them at too. Who has time to stand in a 2 hour line to rock climb when you can use that time getting fried twinkies? When I went to Katy Mills Mall awhile back to find the Hurricane Simulator to try (note, they also have one at the zoo) I noticed a large rock wall in the food court with no line. Last weekend I decided it was time to finally face my fear and climb the wall. As I'd feared, there were several elementary aged kids climbing the wall as their parents sat and ate lunch, and my old fear of being bested crept up. I tried to get my daughters to climb with me, but they weren't having any of that. They'd rather have a good view of Mom failing. So alone I went and paid my $6. I asked the man if adults ever climbed and he assured me they did. I wasn't convinced, but it was too late to back out. I grasped a hold of the first rock and felt everyone's eyes on me. The lone adult amongst the little climbers. I heard the ding ding dings as they reached the top. I worried I didn't have the upper arm strength to go all the way. I put one foot above the other and lifted myself up with my legs. It wasn't nearly as hard as I imagined. With my new found confidence I pushed on and on and in no time I found myself face to face with the bell. I gave a proud wave to my family below and made my way back down. Take THAT third graders!